Charming country villa in Tuscany not far from the Tyrrhenian coast. The Villa is part of a vast agricultural estate that extends from the Tyrrhenian Coast and the Pisan hills is rented for exclusive use. The Villa of approximately 630 square meters can accommodate up to 20 people in 8 bedrooms on the first floor, all with private bath and 2 bedroom annexe adjacent to the lovely Villa. Old mansion still retains its original furnishings. The halls are adorned with large stone fireplaces, sofas, long wooden tables where once the masters loved to spend long winter evenings. The hall can comfortably accommodate 27 people, while the dining room table can accommodate up to 22 people seated. From ground floor to the first floor of an imposing wooden staircase that separates the living from the sleeping area. From the main hall leads to the backyard where the BBQ is located in stone and the roof terrace with lovely views over the valley. Inside the park is the swimming pool (12×6) furnished with loungers and umbrellas. The genuine antique furnishings and huge windows overlooking the garden to give Villa a truly from another era. 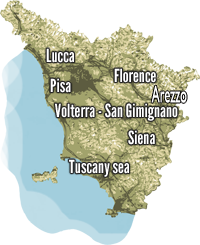 The location is excellent for visiting the art cities of Pisa, Lucca and Florence or stay at sea. At the request may be required to breakfast or dinner with typical Tuscan menu. An ideal base for groups of friends and family gatherings. The total price accommodation includes: towels, bed linen (pillowcases, sheets, pillows, blankets), cooking gas, electricity, water, heating, private parking.